The measures, contained in four motions outlined by L.A. Councilman Mike Bonin, are among the first concrete proposals in what city leaders say will be a $2-billion plan to ease, if not end, homelessness. It also marks one of the first times a city leader has proposed specific sites to provide local homeless services as the city continues to craft plans to deal with the larger shortage of housing for those in need. Bonin’s plan, announced Friday, comes amid a significant increase in Los Angeles’ homeless problem in recent years, prompting much debate at City Hall and beyond about how to reduce the problem. 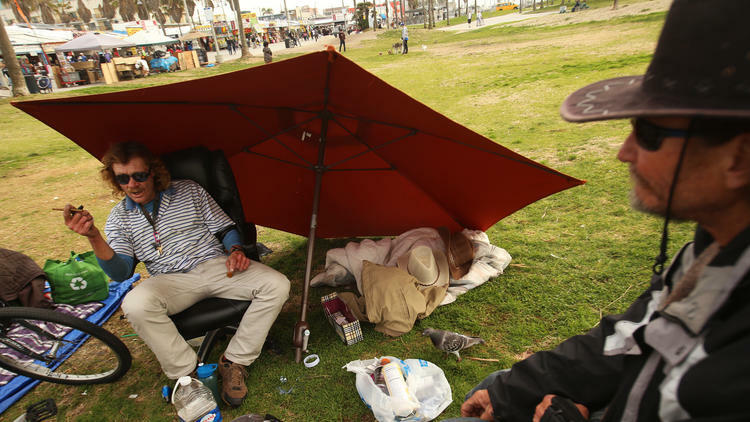 Venice has long struggled with a large homeless population, especially in and around the landmark boardwalk. But tensions have increased more recently as the homeless population has grown and the surrounding area has become a favorite of tech companies and employees. The Westside councilman described his plan as a “street strategy” to help more than 1,000 homeless people drawn to the coastal community, and said the measures would mitigate the effect of street encampments on neighborhoods and business districts. Developing the Pacific-Dell site, currently a city-owned parking lot, as housing for homeless people and public parking. The lot is at 200 N. Venice Blvd. Reopening the vacant Westminster Senior Center at 1234 Pacific Ave. for homeless storage, bathroom access and office space for a case manager to connect people to housing and other services. Providing 24-hour access to restrooms at Venice Beach. Bonin also called for exploring other ways to increase bathroom facilities, including the use of portable toilets. Giving $50,000 in city funds to Steven and Regina Weller, whom Bonin said had teamed with Los Angeles police to place homeless people in substance abuse treatment programs and in shared or permanent housing. The money will come from the Venice surplus real property fund, the motion said. Advocates applauded the proposals, saying the bathroom and storage plans could move quickly, if the council supports them. “These are really positive steps forward,” said Becky Dennison, executive director of Venice Community Housing. “Any time an elected leader is saying, ‘Yes, in our backyard,’ that’s really significant,” said Christine Margiotta, president of community investment at United Way of Greater Los Angeles’ Home for Good project. Other community members questioned some of the plans. Mark Ryavec, president of Venice Stakeholders Assn., said homeless storage should be in an industrial zone, not the residential neighborhood surrounding the old senior center. The costs of the Westminster access center could be covered by funds set aside for storage and emergency shelter during the now-fizzled El Niño season, Bonin said. Dennison said building the Pacific-Dell housing on city land was crucial to overcoming the Westside’s high land prices. Bonin, in his motion, said the project could maintain or increase the amount of public parking in the area. Ryavec, however, said the Pacific-Dell lot should be redeveloped as a parking structure and warned that the housing project could exacerbate the community’s severe parking shortage. He also said opening the bathrooms overnight would encourage homeless people to continue camping on or near the boardwalk. The proposal is part of a larger debate about homelessness in Venice. Late last year, activists sued the city to strike down Los Angeles’ 27-year-old overnight beach curfew. Some community groups fear lifting the curfew could worsen crime. 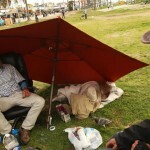 There have also been some controversial clashes between the LAPD and Venice homeless people. Last year, a police officer fatally shot Brendon Glenn, an unarmed homeless man, generating criticism of the LAPD and a lack of city resources for homeless people. The city’s Police Commission last week ruled that the shooting was unjustified, and Chief Charlie Beck has publicly called on the district attorney’s office to prosecute the officer who shot Glenn.